A refreshing addition to the Summerland Art Gallery as the new Artist in Residence, Barbara Wellborn adds an element of fine art steeped in tradition and deep with vision and story. 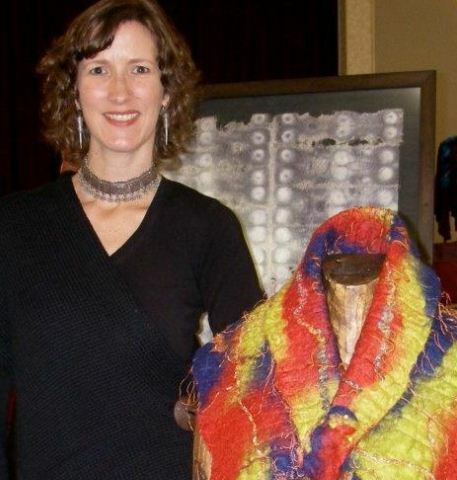 As a professional fibre artist she has been honored to engage the public in the Summerland Art Gallery studio as well as through a series of classes and other seasonal events. After a successful art career in Dallas, Texas, American born Barbara McQueeney Wellborn has found joyful inspiration in her new Canadian home town. Her role in the gallery has forced her to explore a new realm in teaching but also allows her the time and space to live through her work while embracing the local community. 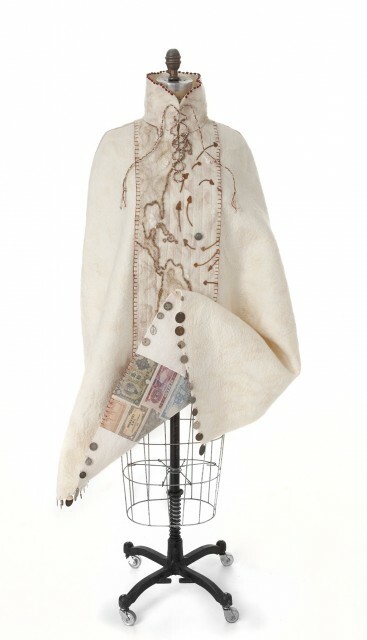 Graduating with a BFA in Fashion Design, Barbara has always been drawn towards cloth. She feels there is a universal and binding nature to it. “It touches every moment of our lives,” she says, “from the blanket in which we are embraced at birth, to the shroud in which we are encased at death. Cloth is timeless.” What draws her in is the symphony of shape, form and colour that emerges as the art works through her. Over the years her passion and focus have shifted from traditional dyeing techniques to the exploration of pieces with rich stories in felt and encaustic collage. She uses a fabulously brave and eclectic mix of ancient and cutting edge techniques to compose textural and visually alluring works of art. Her works include nuno rusca felted fabrics, hand-dyed silks, wools, embroidery, beads and found objects that call to her for a new voice. Most recently she has turned to the earth to help dye her creations with a burial technique that exposes the fabric to the minerals and elements with archaically engaging results. Her most recent work titled The Pilgrimage is an intrinsic link to the past with an inevitable connection to the future, an exploration of one’s place in the universe in the search for a place to call home. The techniques employed range from hours of labour intensive traditional hand felting and stitching to modern forms of screen printing and embellishment. Included in the piece are items that one might find on a pilgrim along his journey. 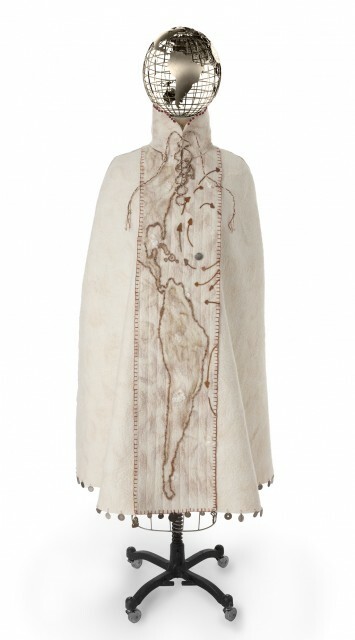 The cloak is adorned with coins, religious medals, and other icons of his identity that would have once been carefully stitched into the lining of a garment for safe keeping. The maps in this piece mark where he has been and where he is going on the quest to find his way home. The poetry in the garment echoes the fruitless search that man has experienced on his endeavor to find an earthly anchorage. When asked why she chose the Okanagan Valley as her home, her answer is clear. “I never felt at home in Texas. Here the mountains, the lakes, the trees, beacon to me. They call me home. I am grateful for the immense beauty I am surrounded by every day. I am called to greater heights of creativity.” Her Okanagan home is a place that not only inspires her, but also allows her to push the boundaries to explore her vision in Wellborn Fibreworks. You can find out more about Barbara Wellborn and her creative journey by visiting her at her studio in the Summerland Art Gallery. For an appointment, please email her at wellbornfibreworks@shaw.ca or call her at 250-486.5820.